I cut my sleep into two chunks, one corresponding to a normal sleep or wake time in the country I'm leaving from, and one corresponding to a normal wake up time in my destination. So, for example, last week I came to Japan, which is eight hours off from California time. I slept only four hours, from 4:30am to 8:30am, which sounds like it must require intense discipline, but really it ends up being a necessity because I leave all of my travel preparation to the last minute. By the time I was on my plane, it was 1:10pm in California, which is 5:10am in Tokyo. I waited for fifty minutes and then fell asleep, waking up four hours later at 10:00am Tokyo time. I don't usually find it easy to sleep on planes, but with only four hours of rest the night before, I drifted off while sitting up straight in my chair. Waking up was easy too, because I had accumulated eight hours of sleep in the recent past, which meant that I was fully rested with a normal Tokyo wake-up time. 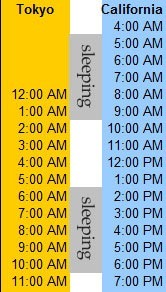 Besides just waking up at the right time, I try to simulate it being morning as much as possible: I drink green tea, sit in front of my laptop at maximum brightness, turn on my seat light, and open the window if it's daytime. I also make sure to set my watch to the destination time before going to sleep. This method is extremely effective. I was awake and alert all day upon arriving to Tokyo, went to bed easily at a normal hour, woke up at the correct time the next day, and have been on Tokyo time ever since. Give it a try! It is very interesting and effective post. i tried according to your post. i really felt good. I used to get pretty disruptive jetlag when I traveled. I also used to have a very unstable sleep schedule and a lot of trouble waking up promptly in the morning. I started taking 3mg of melatonin nightly - it's a hormone your brain secretes to trigger sleep, so it's mild, not a pharmaceutical like Ambien that causes hallucinations and coma-like sleep. For the first week I took melatonin it was pretty rough. I fell asleep hard and waking up felt like climbing out of a well. After that week I adjusted and it's no big deal. And I used to be like a zombie in the mornings, had a horrible sleep schedule. I missed tests at college, I was late to work all the time. It's now very manageable, it's not a problem at all. That's life-changing. But the unexpected bonus: I flew to Siem Reap from Seattle last year, a near-total inversion of my schedule. I arrived at 10:30pm, took my melatonin at 11, went to bed by midnight. I fell asleep, woke up in the morning, ready to go. Zero jetlag. Miraculous. On the way back, I flew BKK->SEA - a pretty rough flight with an 8-hour layover in Seoul. I got back to Seattle and, again, took my melatonin, slept, woke up, ready to go. It came as a total surprise to me, but it was unmistakable. The only problem is that first week on the melatonin can be pretty rough, so you can't just take it now and again to handle jetlag, it needs to be a regular supplement. "turn on my seat light, and open the window if it's daytime"
Excellent advice. I actually did just this on the way to Australia (where I am now) and I found that I was fully adjusted on my first day here. Personally, I just boycott time and sleep whenever I feel tired and get up whenever the body is ready. I don't believe in jet lag. But then again, I almost never fly either. I've been very fortunate to have never experienced Jet Lag, I'm not even sure I get what it is exactly. Does it mean that you are overly tired when you land somewhere? Does it mean that you get sick or feel "unsettled" from travel? I did a year of travel in 08' and each time i landed in a new place, I felt super excited to be there and can't once think of being overly tired or not "well" in any abnormal way. Does everyone who travels experience some form of Jet Lag? I'm wondering if I'm all alone here, or do others feel pretty well and adjusted upon landing in a new place? This information will come in quite handy when I leave for Tokyo in a week. Last year I had the luck of being totally exhausted by 9pm Tokyo time and I woke up perfectly at 5am the next day. I loved starting my morning quite early in Tokyo though. It is so pleasant and relaxing in the early morning. hey Ty... a couple of things to add for this one. basically you want to put yourself into the mode of the destination zone as early as possible. that means sleep of course. But food is also very important to circadian rhythms - and so is the type of activity you engage in. So when you wake from your initial 4 hrs sleep, don't eat or drink coffee/tea (u dont do that in the middle of the night in Tokyo...). Then go to the airport on autopilot sleeping on the train and not activating your brain with anything unnecessary (you should basically be in sleep-walking mode). Do as little as possible in the airport (no laptop/ thinking/ eating/ shopping). Get on the plane and go straight to sleep. Set your alarm to wake up, as you suggested, at a reasonable Tokyo morning time and proceed to "start your day" - coffee/tea, activity, reading, some squats in the aisle and breakfast. Going westwards is usually much easier in terms of jetlag than going eastwards! I got a present today and it's not even my birthday or Christmas. That present came from myself, and it came in the form of a half written blog post and the title for another one (this post here, in fact). Since implementing the no computer after 11 rule (which, I'll admit, I'm not totally strict about since adopting the thousand word a day mandate), I've noticed that I leave myself these sorts of presents a lot more often than I used to. The gift I'm talking about is a productivity softball. Normally when I sit down for my daily thousand, the first fifteen minutes is spent battling the impulse to go see what's new on hackernews, and, once that impulse is controlled, staring off into space trying to decide what to write about today. "Sebastian, do you have any suggestions on getting back on a regular sleep schedule after traveling/strange hours without resorting to melatonin supplements?" Yeah. It's remarkably simple, actually. You wake up like normal at 6PM Tokyo time, and then you make preparations and plans to stay up all night and all of the next day, and you put yourself into places/situations where you physically couldn't sleep.